Jiena nixtieq nirringrazzjak talli tajtni l-opportunita tal-edukazzjoni tajba u xoghol, u kburi li jien Malti u Ewropej! Not only because he knew how to deliver his speeches right down to people’s hearts, but because christian democratic principles were always the beating heart of his policies. Eccelenza, grazzi ta dak kollu li ghamilt biex Malta saret pajjiz demokratiku. Grazzi Akbar tmur lejn il memorja tal familja tieghek, ghax kieku ma kienux huma li ssupportjawk, ma kienx jirnexxilek taghmel il gid kollu li ghamilt. Malta tibqa dejjem grata lejk, lejn t twemmin u l valuri tieghek. Eddie Fenech Adami – Missier Malta Ewropeja – Missier Malta li vera ghamilha Taghna Lkoll – nixtieq naqsam maghkom hsieb zghir – Dan il Bniedem ghallimni hafna valuri li flimkien ma zewgi Joseph Smart ghaddejnihom lill uliedna – generazzjoni li ghadha tiela u li thares lejn Eddie bhala Politikant Kbir. Li naprezza f’ dan ir ragel hu li kull meta jiltaqa mieghi jew ma zewgi jghidilna ara z-zaghazagh ta’ Rahal Gdid – Tibqa tapprezza hidmitek fi hdan il Partit – Grazzi Eddie. Ir-ragel li tisma ismu u jqabdek il-bard. Bdilt Malta ta taht fuq, u il-pedamenti li bnejt int ghadna qed ingawdhom. Dear Dr. Fenech Adami, please accept the heartfelt thanks from all our family for all you have done for us and for our country. You will always be remembered in our thoughts and in our prayers. May God give you many more years of health, peace and happiness. Thanks for your courage and vision, by always steering Malta in the right direction, and convincing the nation to follow you in very difficult times. Modern Malta, as we know it today, is thanks to you. It is thanks to Eddie that Malta came forward in leaps and bounds after the years of uncertainty, violence, threats, corruption and worse that we suffered under Labour. It is important that history is kept alive, because it is our duty to remind the younger generations, lest history repeats itself – as, sadly, we are seeing at the moment, with this corrupt government. 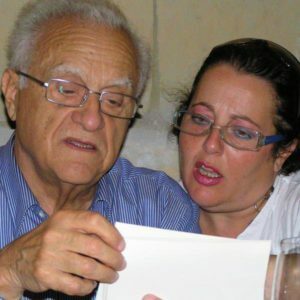 You have done a wonderful job with coming up with the idea of this website, because it not only serves the above purpose, but because it is the least that could have been done in recognition of all Eddie has selflessly sacrificed and endured for the good of Malta. Thank you, Eddie – Malta is indebted to you!